Making pizza offers unlimited learning possibilities! 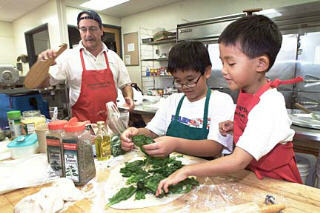 Pizza making can be an incredible educational experience for kids. There are multiple skills involved in making pizza. Pizza allows unlimited learning opportunities! As you follow the dough recipe you are reinforcing reading skills and following directions. According to scientific studies the absolute best way to increase reading ability, believe it or not, is to read! Take turns reading and working with the dough. Following directions is another important skill to learn and reinforce. Some of us never get the skill of following directions. (I'm still working on this one). When you measure out ingredients you use math skills. Basic measuring skills can be taught just by using the dough recipe. You can ask such questions as: "how much ingredients would you need if you double or triple the recipe?". Higher level math skills can be used when figuring out the cost of each pizza. You can then try to compute the cps (cost per slice)! Real life problems and incidental learning are a great way to acquire and reinforce various skills. Pizza can also be used to learn fractions! Cynthia Lanius has developed a fun way to learn fractions with pizza. For an overview go to the Table of Contents. Here is another math resource created by Helena Bonaparte, Teresa Tyler, and Tiffanni Hermon-Wardell: Click HERE. Observing how the yeast is activated with warm water and sugar, is a science experiment. Yeast is actually a living organism. You are "growing " the yeast when you activate it with warm water and sugar. Rising dough is not a chemical reaction, but actually a biological process. OK, I am sounding a little to scientific here, but you get the idea. For more information on yeast, Stanford University has compiled a great resource: Click HERE. I really want to encourage you to try making home-made pizza. True, it does take a little effort to get started. The fun of the experience will be worth the effort! I have taken my pizza making skills on the road a number of times. I have given demonstrations for 2 people and taught a class of over 100! Each time has been an adventure. To be honest, I think I enjoy it more than the people who are participating! Try it yourself and experience the magic of making pizza! Restaurants In Honolulu: Discover the Best Restaurants in Honolulu.